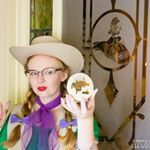 Over the weekend the ever lovely Cailey, aka Dole Whip Dame on Instagram, put together a little Disneybound event, where she encouraged her friends to be inspired by the Main Street shops and windows. 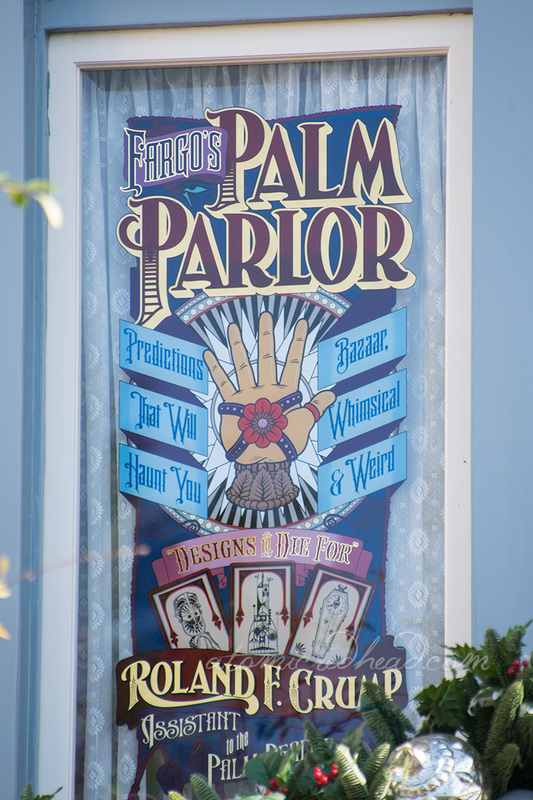 I chose Fargo’s Palm Parlor, a window that honors Roland (aka Rolly) Fargo Crump, a Disney animator and Imagineer. Rolly Crump worked on such classic films as Peter Pan, Lady and the Tramp, and Sleeping Beauty, then went on to wok on attractions such as the Haunted Mansion, the Enchanted Tiki Room, and it’s a small world, specially, the Tower of the Four Winds, all attractions are depicted on his window designed as tarot cards, take a peek at the window here. I love these sort of Disneybound ideas, because they really require you to think outside the box. Normally Disneybounding is character based, and involves color-blocking based on the character’s outfit, so it’s can be easy to come up with an ensemble. A building, window, or attraction allows for more freedom of interpretation. For this, I opted for a vintage Gunne Sax that was a pale shade of blue with white trim, like the building itself. 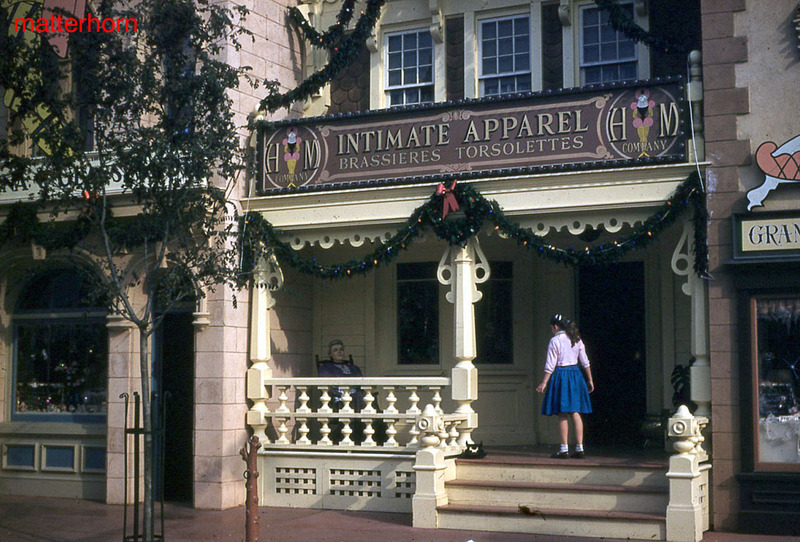 I also loved the lace-up detail on the front, especially for this bound, as the location of the Palm Parlor was originally Hollywood Maxwell’s Corset Shop. You can see a picture of it here. I then added a purple scarf to tie in the purple details of the sign and window. Then I chose the bracelet-ring combo to reflect the hand, as well as the shawl, which featured both the color of the hand, and flowers. I was also thrilled that this event gave me an excuse to wear a Gunne Sax dress. These 70s and early 80s gems have been haunting me like mad lately. I simply adore them but I sometimes have a hard time choosing occasions to wear them! I really want to make a point of wearing them this year. Ha! I guess I just came up with a New Year’s resolution, even though I don’t do them! Boots: Marshall’s…like over ten years ago! I’m so envious you’ve been able to find Gunne Sax dresses that fit! All the ones I come across are incredibly tiny, especially through the bust. Fingers are still crossed that I will eventually find one that fits. Like you said, most of the ones I do come across are tiny! I have found dozens that are teeny tiny, and when I do find one that fits, I am overjoyed. So most of the time I buy it, which has resulted in a handful that I hope make more appearances on the blog! You could not look any more beautiful, Janey! I am always very impressed at the amazing things your dad finds for you! Divine in Gunne Sax! I love the matching of outfit with building.